Gluten-Free Living > Tips > Do you have a recipe for a refreshing summer salad? Do you have a recipe for a refreshing summer salad? Celebrate the season with this bright and easy Strawberry and Chicken Salad with Lime Dressing. 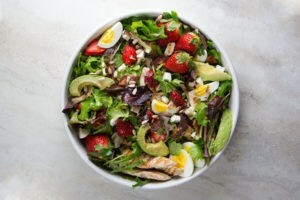 If you can find locally grown strawberries and greens, use them in this salad for the best flavor.